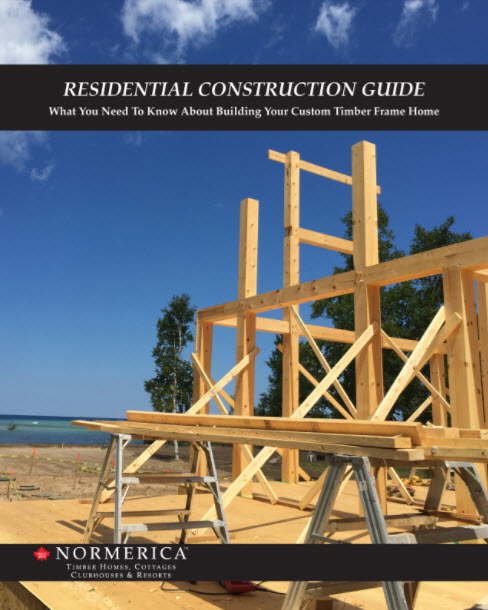 An in-depth reference tool to walk you through the process of building a Normerica timber frame home or cottage. At Normerica, we promise to provide you with a unique custom timber frame home that’s designed to be constructed with a high level of timeline and budget predictability. It’s our goal to not only work with you to create a stunning timber frame home that’s perfect for you and your family, but also to ensure that the entire process from design through construction is as simple as possible for you. We don’t stop there though; we stand firmly behind our buildings, offering an industry-leading warranty that affords you peace of mind. You can rest easy in the knowledge that your timber frame home is built to our exacting standards and will last for generations. What’s included in Normerica’s timber frame shell package and what flexibility and customizations can be built into your design? Detailed budgeting for building your new timber frame home including everything from land costs, legal fees, site servicing costs, construction costs and more.